Lovely Brussels sprout pie! I'm sure it was yummy! I know it can be sad when something ruins your owngrown plants. I also prefer organic food. And Christmas is indeed for enjoying and relaxing! I'm also watching good films and eating delicious food. I happen to be spending Christmas in Brussels, having driven for 14 hours on ice through a snowstorm to get here, so I really should try this. Thanks for such an amazing looking recipe - no one can say they don't like sprouts now! Is there a recipe for those gorgeous looking trees or is it simply mashed potatoes and herbs cut into shapes? what do you put in the potato cakes? are they just mashed potatoes with parsley chopped up and mixed in? The crust on this looks so beautiful. Fine job! I have never heard of a hot water crust pastry. Vegging on boxing day...sounds good to me). wish I'd found your fab blog earlier! I just got off the phone with my sister in Glasgow and there you were - I am now a follower. Hope that you are keeping warm in this severe winter in the UK. Christmas is very bittersweet I think - lots of sadness with the joy for many of us. Looking forward to trying your recipes across the miles in Montana. Have I mentioned before that I'd like to move in to your place? Yum, once again, this looks superb... I only ate my first brussels sprout around 6 months ago, and surprised myself by falling in love with them. What a great idea to pie them up. brilliant idea! while i eat plenty of faux meat, i never think it's exciting enough for a holiday meal. this looks just wonderful. and those potato cakes mmmm. my mom made falafel for the vegetarians this year. i don't think she knows what they are really, but it was a nice sentiment. I will definitely try this one out. I love veggies and am always looking for different ways to serv them! I understand how you feel about your allotment. I miss having a garden! 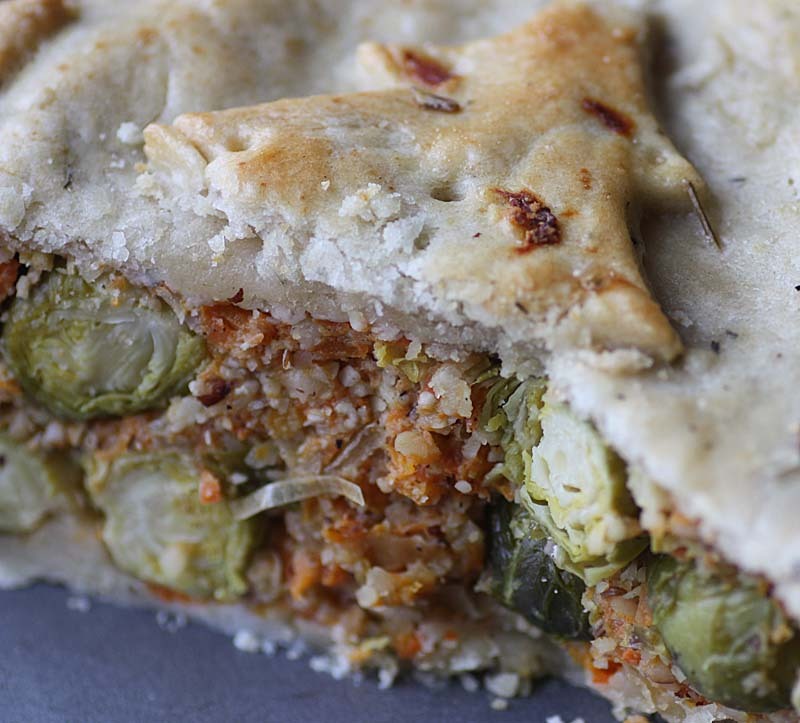 Oh, my, your brussels sprout pie looks divine. I made some bacon-braised brussels sprouts for xmas, and they went over even with the guests who don't usually take to brussels sprouts. I look forward to trying your recipe. Those white cabbage butterflies are terrible!!! I love your cute pie! I wish I could love or hate marmite but I have really never tasted it (just heard of it!). Happy holidays! 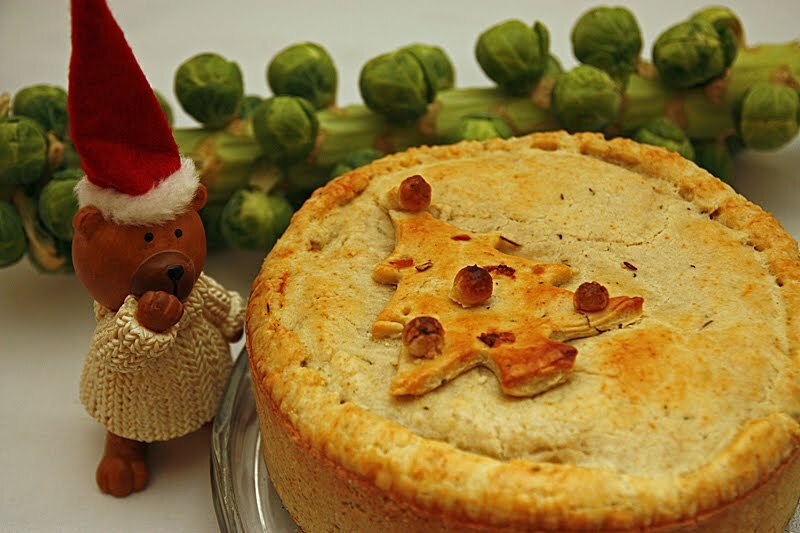 the pie recipe is awesome...i like the idea of a potato Christmas tree!! I love my brussels sprouts. Like you I spent a couple of minutes lamenting that I didn't have home grown sprouts this year (last year was the first time I grew them and there were fabulous). I tried growing them in containers this year .. well, the idea was to start them in containers and transplant them .. but we never got back to Leitrim, so they stayed in (large) containers and never developed well. Luckily we got some on the stalk brussels from our box scheme. I still have lots left, so I may give the pie a try ... although I'm still planning on making the mushroom suet pie before the year is out! Will you be able to return to your allotment plot next year? I love your Christmassy food ideas. 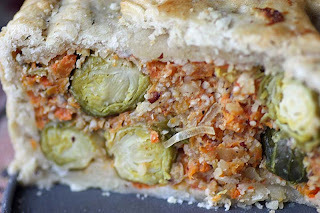 I'm not a fan of sprouts but the pie looks delicious! This looks wonderful. Brussels sprouts is my favorite vegetable! I've never really had them other than roasted with some salt and pepper though, so I'd love to try them in a pie like this. Thank you so much LeLa. Organic veg is really expensive that was one of the reasons I started growing my own. Thank you P. M. Doolan. that is so funny, you actually spending Christmas in Brussels. wow 14 hours on ice through a snowstorm is a long drive. I get stressed at the idea of driving to my mother in law in Essex which is about 8 hours. Take care and enjoy your holdiays. Nice to meet you. I've seen a numbe rof your comments on Nic of NIpitintheBud blog. So i am delighted to hear from you. 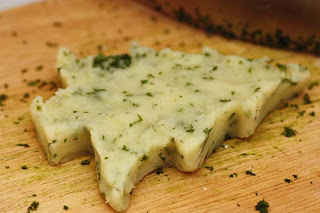 The recipe for those herb potato trees is really quite4 simple, but I am going to share a link of a fellow blogger who made them a few years ago. They are originally shaped into starts, but I used a christmas tree cookie cutter. Hi there Jane aka Chicken lover. or should i call you gadget woman? See above for the potato cakes. They really are simply just mashed potatoes with parsley chopped up and mixed in. I discovered hot water crust pastry about 10 years ago or so, its similar to what is used for pork pies, but of course this is veggie friently. I am so thankful for this recipe that I discovered originally through the U.K Vegetarian Society. Once you've mastered it, you will soon discover that it is so versatile. Thank you So, So much chocolategirl64. Thank you So, So much Marian. You are just too kind and I totally appreciate you becoming a follower. The weather here is severe, but on the plus side the snow had began to melt. You are right Christmas (and New Yer may I add) is very bittersweet. Kind and warm wishes to you. I'd be happy for you to move into to my place. Just a shame its a on-bedorrom flat :( and my husband woudl not be a happy bunny. I am delighted to read that you actually really really like the sprout. I am still learning to like them. It is good at least that you mother makes an effort with providing a veggie alternative. Thank you Travel Nurse Extraordinaire. I am sad to read that you miss having a garden. I hope one-day you get one that wiill make you happy! Thank you so much Eggy. I think the secret is finding ways of serving sprouts that appeal. Yeph those white cabbage butterflies are terrible!!! Marmite is certainly an acquired taste. Heres hoping you find a jar. Happy holidays! Thank you so mcuh Ferris Jay. It is interesting to read that you attempted to grow some sprouts in containers. As I have limied space it is something i would have attempted, but now knowing it was not a success I will give it a miss too. Please let me knwo how you find the mushroom suet pie. Sadly returning to the allotment is a no no. I lost is in a fire. Thank you so much for your lovely words Johanna. Whislt writing my post I did actually think of your father in law as i remembered reading your post and not too long ago your Yellow post. Ds mother spend Christmas with Ds sister, but i know he really wanted to be with her. Wishing you and you family -peace and joy too. Thank you so much for you lovely words Hannah. Thank you so much forkblog for you kind words about my blog. I promise to visit you blog very soon. Ah you make me smile by writing 'Brussels sprouts is my favorite vegetable'. I have to admit I hav enot many people like you. Roasting them is my fave way of eating sprouts too. Wow that pie looks so fantastic. I may have to make this soon. I am so glad you commented on my blog so I could find yours! I have really enjoyed reading your posts. I am also very sorry to hear about your father-in-law. I hope the New Year is a better one for you and your family. This might be the most unique dish I have ever seen! All the herbs and generous amount of crust make it total comfort food! Thank you so much for your lovely comment on my blog! Thank you so much for such a lovely comment The Food Hound. Happy New Yera dear blog friend! I am pleased to see garlic on you banner! he!he! sooooooooooo French to me! 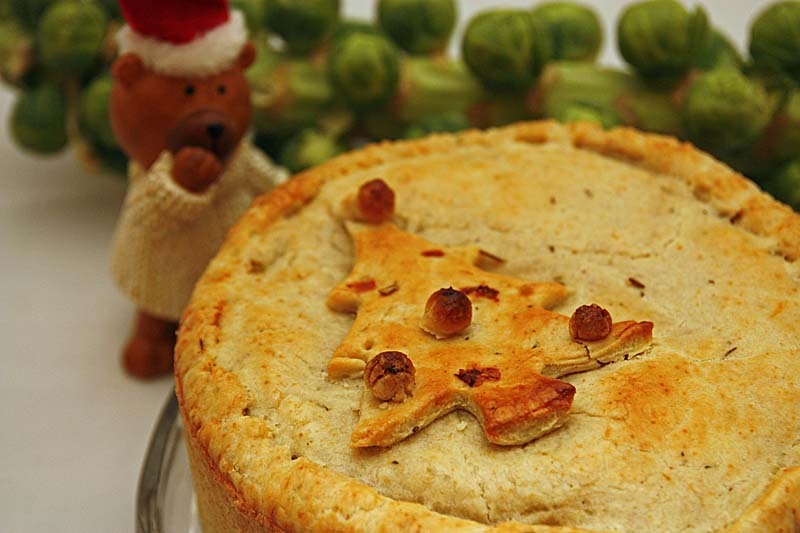 It took me 2 weeks to assemble and prepare the ingredients - hunt for a 7in springform, steam and store the carrots in the fridge, pluck the sprouts from the stalk and store, search for marmite (w/no luck)- but I finally put the pie in the oven! Will let you know how it tastes! Thanks for the adventure! I am waiting and looking forward with some trepidation to your honest verdict. I am sorry that you did not find any Marmite where you are. So did you find an alternative yeast extract to use; and shortening as I can imagine 'Trex' the brand may have been difficult to get hold of too. I am happy to post you a little jar of Marmite from the U.K if you wish for future recipes. E mail me your posting details if you wish to take me up on this offer, no obligations. Okay looking forward to hearing from you.